Mesut Ozil returned to the Arsenal squad having been dropped for the loss at West Ham, but Emery left the German on the bench – with a serious-looking knee injury to Hector Bellerin the only negative for the Gunners. Arsenal maintained the momentum which led to their opening goal as Aubameyang stole the ball after a Cesar Azpilicueta slip – but he was closed down well before poking an effort at Kepa. Marcos Alonso headed against the post as Chelsea ended the half strongly, although it was Arsenal who went in ahead – just the third time Emery’s side have managed to do so in the league this season. Pedro fired over and Alonso wide but Leno remained untested as the game entered the final 30 minutes – with Sarri turning to Ross Barkley, and then former Arsenal striker Olivier Giroud, in search of a goal. Mohamed Elneny replaced the full-back as Arsenal’s final change after Emery had introduced Alex Iwobi and Ainsley Maitland-Niles – with his decision to substitute Lacazette again met with loud jeers from the home support – minutes before Bellerin’s injury. 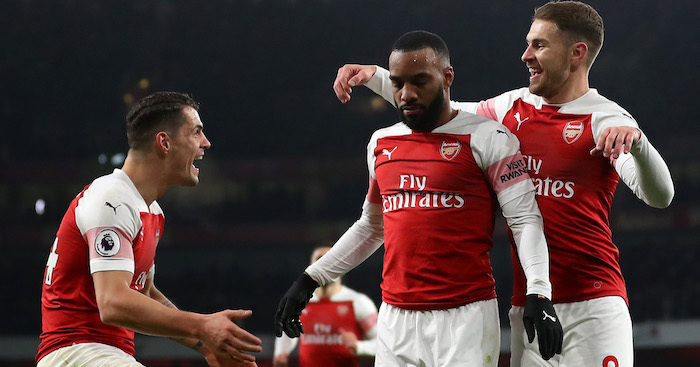 The post Lacazette and Koscielny net as Arsenal confidently brush aside Chelsea appeared first on teamtalk.com.